Thane is a city with great historical background and has surprises for the rich, poor and people of all age groups. The city dazzles with events, exhibitions, festival celebrations, sports activities and on top of everything food festivals which are an open invitation to all food lovers. These food festivals are arranged by some of the local organisations in Thane as well as the hotels and restaurants. The word of these festivals spreads fast in the city and it is seen that there is always an applauding response from the foodies. 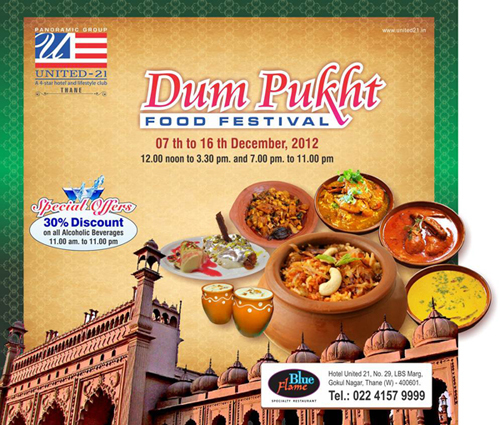 We have great news for the food lovers of an incredible food bonanza called Dum Pukht food festival going on at Blue flame restaurant of our Hotel United-21 in Thane. This festival started on 7th of December is open from 12.00 to 3.30 AM and 7.00 to 11.00 PM. In our trend to offer popular food from different regions of India, this time at Dum Pukht food festival we are offering delicacies which the Maharajas and Nawab’s used to eat. To get the feel of the Nawabi food the restaurant is given a royal touch regarding its decorations. Blue flame restaurant is in the limelight due to this marvellous feast. With some of the exotic treats like Kakori Kebab and Hara Mutter Galouti you will enjoy the delicacies which the great kings of their times preferred. To offer a fine touch to the festival and create an atmosphere of the by-gone days the stewards of blue flame will be seen in Peshawari outfits along with Pagdi's. Sura Dani Hukkas and tissue hangings are added to the decorations to offer a perfect match to the theme of the event. Never miss this rare chance of relishing the taste of the royal food at this event specially arranged for the taste savvy. Never mind if you have not yet visited the food festival in Thane, you have every chance to walk in to the event till 16th of December. Visit our Hotel United-21 in Thane and take along with you a royal memory of the incredible food festival.